At least one resident was injured after jumping from a second story window when a fire broke-out at the Arium Trailwood apartments Thursday evening. 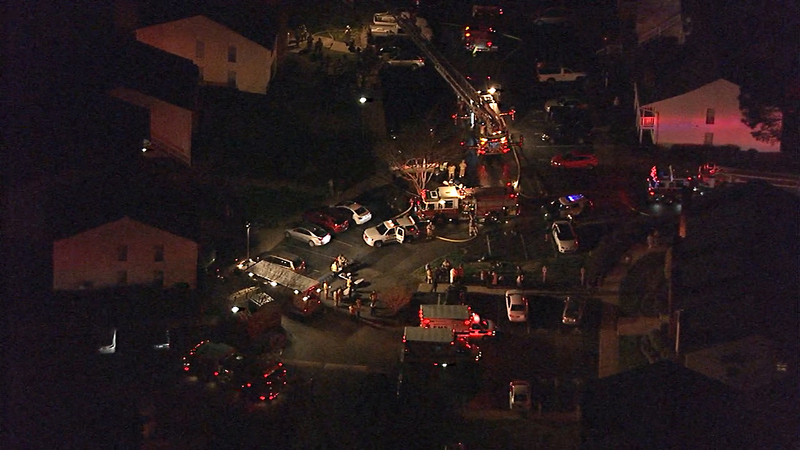 RALEIGH, N.C. (WTVD) -- At least one resident was injured after jumping from a second story window when a fire broke out at the Arium Trailwood apartments on Thursday evening. It happened about 6 p.m. at 3121 Aileen Drive in Raleigh. UPDATE: Aileen Drive apartment fire contained to 3 units. All occupants accounted for. At least 1 trapped resident jumped from second-story window. Chopper 11HD was over the scene as firefighters with flashlights were visible on the roof of the building, which appeared to sustain substantial damage. Megan Dupree came home from work to find the sea of fire trucks at the complex gates. Minutes later she found out it was her building, 3121, that was on fire. It wasn't Dupree's unit, but as she waited with a blanket outside in the cold, she worried if her two cats survived. "I'm just worried because of the smoke. I don't care about any of the other stuff in the apartment. I just wanna know if my cats are OK," Dupree said. About 75 firefighters responded to the call. It took about half an hour to get the fire under control. A total of 16 people were displaced by the fire, Raleigh FD said. Fifty percent of the building was damaged and eight units were left uninhabitable. Casey Kenner's apartment was one of the four destroyed by the blaze. "Things are just things. It's sad and it'll be hard but that's OK," Kenner said. "I wasn't home and wasn't hurt and it looks like a lot of people got out. So, that's what I value." Kenner went home with friends and family. Fire crews respond to an apartment complex in Raleigh. RFD said the fire was started accidentally but did not give further details. Crews on scene said there were no major injuries and no one required hospitalization. The Red Cross is assisting with displaced residents.